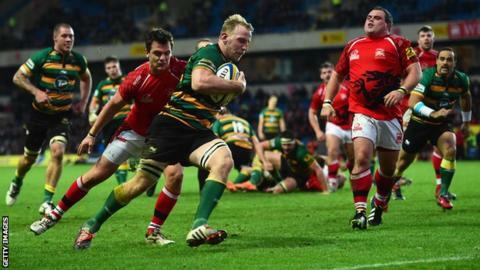 Northampton ran in seven tries to easily beat winless bottom club London Welsh and go top of the Premiership. The champions were clinical and led 19-0 at the break through Calum Clark, Stephen Myler and Samu Manoa tries. The lead was soon stretched by Jamie Elliott and Ben Foden before Taione Vea replied, only for James Wilson to run clear and score straight from kick-off. Things petered out until Ben Nutley added a late seventh try and Nic Reynolds grabbed a consolation score. London Welsh have conceded the most points in the Premiership this season at 414, almost three times as many as Northampton's 144. A ninth defeat from nine will leave London Welsh boss Justin Burnell scratching his head as to how his side can survive after winning promotion last season. They are 11 points adrift at the foot of the Premiership with a solitary bonus point to their name. Things could hardly be more different for Jim Mallinder's Saints. Despite the absence of England forwards Dylan Hartley, Tom Wood and Courtney Lawes, his pack demolished the Exiles to lay the foundation for a comprehensive win and reclaim top spot. Welsh did, in fact, have plenty of first-half possession, and were not disheartened by Clark's fifth-minute score after an impressive driving maul from the visitors. But for all their ball, they created little and were punished when Myler made up for missing a conversion and a penalty by bundling his way over and adding the extras. The hosts then had Ricky Reeves sent to the sin-bin and within a minute Monoa emerged from a maul to drop over the line. Northampton then pressed home their man advantage after the interval with two lightning quick attacks as first a clever offload from Wilson gave Elliott a simple score, before one-time England full-back Foden shrugged off several tackles to go over. That as good as ended the match as contest, with Saints make a raft of substitutions as the game drifted to its inevitable conclusion. "We're happy. It wasn't our best performance but we're top of the league with a bonus point away from home. "We've not picked up any injuries and we've got our international players returning, so we're in a good place. "It's been a good squad effort - we're disappointed we lost the game against Exeter but we've been on an upward curve. "James Wilson has played really well in the last few weeks and Tom Stephenson has really taken his chance, with George Pisi being away." London Welsh: Jewell; Stegmann, Reynolds, May (capt), Scott; Ross, Rowley; Reeves, Vella, Vea; Schofield, Down; Browne, Kirwan, McCaffrey. Replacements: Morris, Trevett, Cooper, Corker, Pienaar, Lewis, Robinson, Awcock. Northampton Saints: Foden; Elliott, Stephenson, Burrell, Wilson; Myler, Dickson; A. Waller, Haywood, Ma'afu; Craig, Day; Clark, Dowson (capt), Manoa. Replacements: McMillan, E. Waller, Denman, Dickinson, Nutley, Fotuali'i, Waldouck, K. Pisi.